Congratulations to EARTO Members VTT and Helmholtz who were awarded the EARTO Innovation Awards 2018 yesterday during a ceremony held at the BELVue Museum in Brussels. 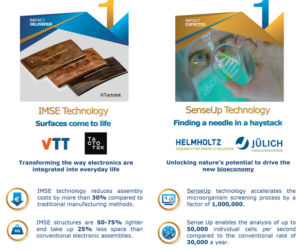 Helmholtz received the award in the Impact Expected category for the development of the SenseUp technology, which makes it possible to quickly and efficiently identify highly productive microorganisms capable of producing the basic building blocks for products made from renewable raw materials. On the same day, EARTO has published the 2018 edition of its “Innovation Awards” brochure, a collection of thirty-two innovations featuring EARTO members, which gives a flavour of the wide range of RTOs’ work. Such innovations demonstrate RTOs’ capacity to support Europe’s innovation performance and their focus on solving today’s challenges and delivering impact. The brochure includes articles on all RTOs that took part in this year’s competition with a special focus on the 6 finalists which are, in addition to the two winners VTT & Helmholtz: CEA, TNO, Tecnalia and Fraunhofer.